I've been playing around making quinoa cakes since I had so much fun creating the Quinoa Cannellini Bean Cakes w/ Roasted Eggplant, Tomatoes & Balsamic Vinegar for Fabio Viviani's recipe challenge. I decided to make a southwestern version with black beans and top it with roasted shrimp and yogurt sauce. This recipe is incredibly easy and fun to make. It's a lot like making meatballs and I used my hamburger press again to make the quinoa patties. There really are endless ingredient combinations that could be created. Hope you enjoy making (and eating) this as much as I did! Cook quinoa in chicken stock according to directions (approx 15 min). Roast baby zucchini at 425 degrees for 15-20 minutes or until tender. Preheat oven to 400 degrees. 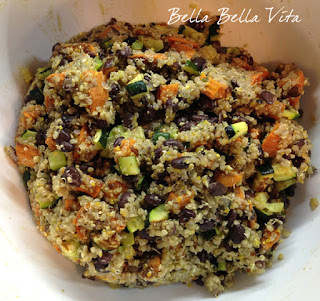 Slightly mash black beans in bowl; add quinoa and rest of ingredients through salt. Mix with hands or potato masher until combined. Make patties using hamburger patti press or other mold. Bake on lightly oiled baking sheet for 10 minutes on each side (I used the cilantro & roasted onion olive oil to give more flavor). For Shrimp: Marinade for 20 min in olive oil, juice of lime, cilantro, salt and pepper. Roast at 400 degrees for 8-10 minutes, just until pink, firm and cooked through. For yogurt topping: Whisk together greek yogurt, juice of 1/2 lime, cilantro, salt & pepper to taste. 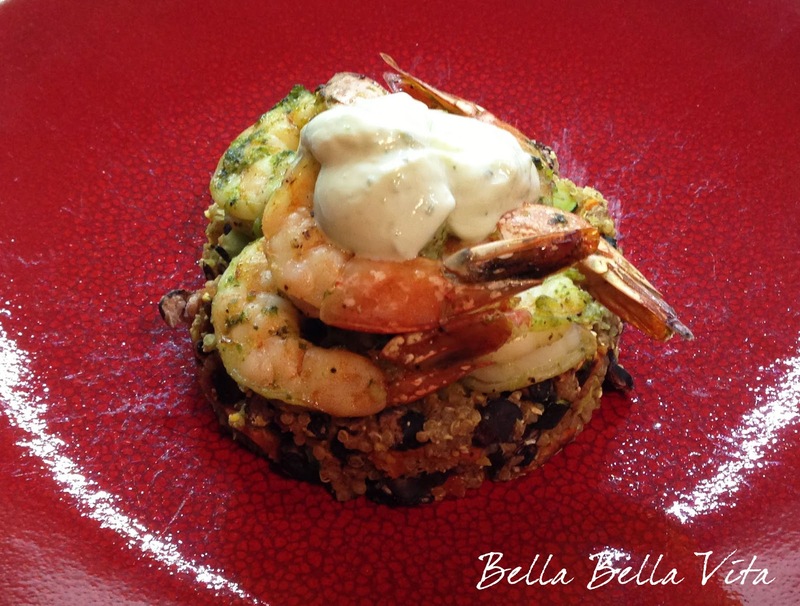 Top quinoa black bean cakes w/ roasted roasted shrimp (3 each). Add a dollop of yogurt sauce and sprinkle with fresh cilantro.